The last place we might think deception would come to us is from within the church through its leadership. Notice Paul begins by making light of what he is about to say, an indication, perhaps, of his concern for its incredulity, but none-the-less, follows it with an adamant plea for them to hear him out, anyway. The last place we might think deception would come to us is from within the church through its leadership. Deception is, by nature, subtle and often occurs over long periods of time. And as we already know from the case with Eve, once we have been deceived we then become deceivers. And when Paul says “he has promised us to one husband, Christ,” although, he is speaking to the church, both male and female, it is men who have, historically, been its leaders. Making it critically important to our understanding that the vulnerability for both men and women is that for “being deceived as Eve was by the serpent,” and not just women. Jesus, having fulfilled the role of “last Adam” (I Cor. 15:45), leaves only the vulnerability of Eve for us to be identified with once we are betrothed to him. Consequently, a church leadership that doesn’t realize its vulnerability for being deceived as Eve was, in all likelihood, has already been deceived and has now become the deceivers of the very ones God has entrusted to their care. In verse 4 Paul, essentially, not only confirms the probability that deception will come to us from within the church, he goes on to say that when it does “we put up with it easily enough.” In other words, it is not just a possibility that we can have the right Jesus for salvation and the wrong model of Jesus for living it out, but a probability. So, how do we know if we have been deceived? Is there a scriptural litmus test for making such a determination? Or is it based solely on the fact that we stand on the truth of salvation through Jesus, and as long as we remain faithful to this message deception cannot possibly overtake us? II Corinthians 11:4, alone, contradict this assertion. After more than 20 years of studying James 1:27, “Pure and undefiled religion before God and the Father is this: to visit orphans and widows in their affliction, (in order) to keep oneself unspotted from the world,” (DBY) the conclusion I have reached is for this passage being, perhaps, the most critical litmus test by which we might determine the degree of our own deception. In my recently published book, Spiritual Widowhood, 17 of its 26 chapters are devoted to an almost word-by-word, and line by line, examination of James 1:27 for the purpose of proving this claim. Key to this study is for the more accurate meaning of the word, “religion,” to be understood in the context of worship. Worship through serving, or the service of worship, as opposed to a worship service. Therefore, according to James 1:27, our worship will either be considered by God as being “pure and undefiled, or impure and defiled: The former bringing restoration, the latter desolation. Based on 30 years of serving widows and realizing that little has changed in that time for the ways they are cared for by a majority of churches, has led me to conclude that widows remain the most overlooked and least cared for people in the world, today. Consequentially, when the connection is made between Jesus’ own assessment of the condition of Israel recorded in Matthew 23:38, “Behold, your house is left unto you desolate,” and their guilt for “devouring the widow’s houses,” (Mat 23:14, Mark 12:40), what other conclusion can be reached for the belief that our own house has, in all probability, become a house left desolate? 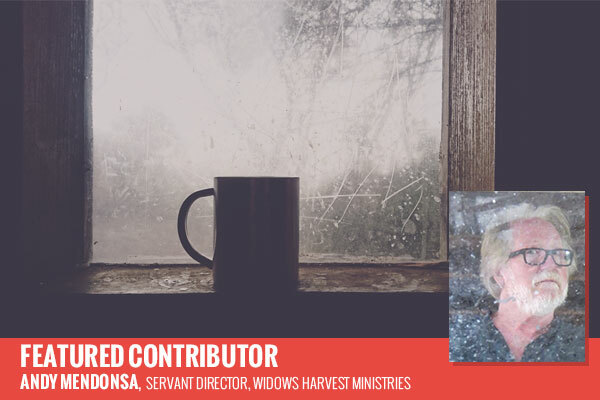 Andy Mendonsa is the Servant Director for Widows Harvest Ministries, a faith-based non-profit he helped found in 1987 in Chattanooga, Tennessee. He holds an Associate of Arts degree, Oxford College of Emory University (1976), and a Bachelor of Journalism degree, University of Georgia (1978). Presently, Andy and his wife Gloria live in the historic and urban neighborhood of St. Elmo with their two dogs; Fergus, a Welsh Corgi, and Thumper, a Basset Hound.